I love bees, and I love taking photos of them. True, I am interested in all wildlife I really enjoy the challenges of macro, but bees are incredible, industrious, collectively intelligent, and indispensable little creatures and a real pleasure to observe and photograph. For anyone who is interested in bees in general (and for some lovely video footage), I recommend checking out the excellent swiss movie, A Taste of Honey, (narrated in English by John Hurt). For anyone who wants to check out some photos of bees (taken with varying degrees of success) there is an enormous Flickr group, Bees, bees bees! which is a great place to start getting some ideas. So how should you approach shooting bees? What gear do you need? And how much will it cost? Well – clearly, I’m not going to tell you to go out and spend lots of money! There are loads of different setups you can use for macro, and the most important thing is that you familiarise yourself and get comfortable with the one that you have chosen. One of my preferred setups is pairing a +2 diopter supplementary lens with a telephoto lens (such as a 70 – 300mm zoom), but you can also use supplementary lenses with bridge cameras, you can try using reversing rings, extension tubes or there are various macro lenses that you can pick up second hand. What I would like to talk about today though, is free. And that’s technique. Many incredible macro shots are taken in studios with artificial environments and complex lighting arrangements – all of that costs money and to my mind means that you lose some of the natural simplicity and beauty of a shot. I’m therefore going look at natural environments in natural light (since specialist macro flashes are also very expensive). I thought it would be useful to reduce it all down to a few simple rules. This first rule goes directly against the advice that you will read in lots of books and magazines – which often say that it is preferable to shoot macro on overcast days because you get fewer burnt out reflections and you better contrast… Well, that maybe true if you’re shooting things which don’t move – but for insects which can be fast moving it’s complete nonsense. You need to be able to shoot handheld and at a fast enough shutter speed to freeze the action. Bright days are definitely best. However, insects (which are cold blooded) have a faster metabolism and are faster moving in warm conditions, so cool days (spring and autumn) and early mornings are absolutely ideal. Rule 2: If the bee is on a flower, get really close and try to shoot sideways on. To really get fine detail with budget equipment, you want to get up close and personal with the bee with a focal distance of just an inch or two. Reversed lenses, macro extension tubes or powerful diopters on shorter lenses are a good way of achieving this. The important thing, when shooting bees like this, is not to get nervous. 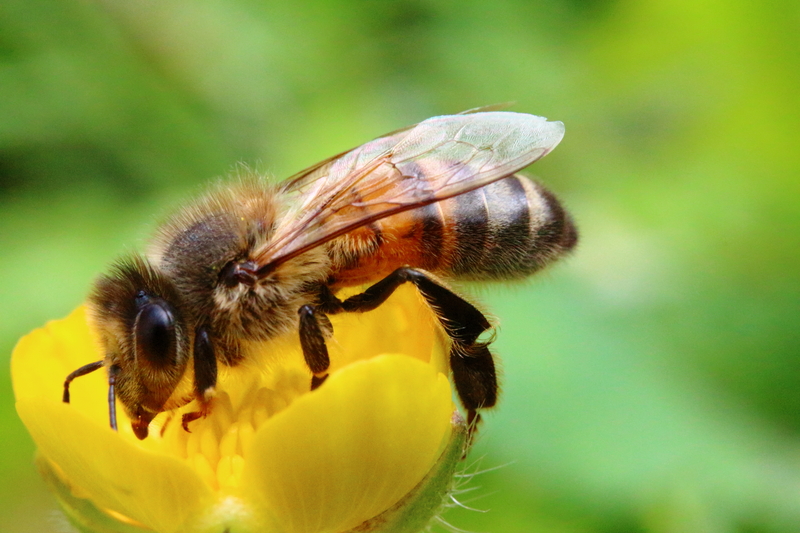 Bees are very placid animals and are very, very unlikely to sting you unless they feel threatened. Often, when getting very close to them, people get scared and react unpredictably. If you feel this is likely to happen to you, it is important to master your instincts. Getting really close means you will have a reduced depth of field which is great for throwing your background out of focus – however it also means that if you shoot with the subject facing directly towards you with the eyes in focus, the abdomen will be out of focus. 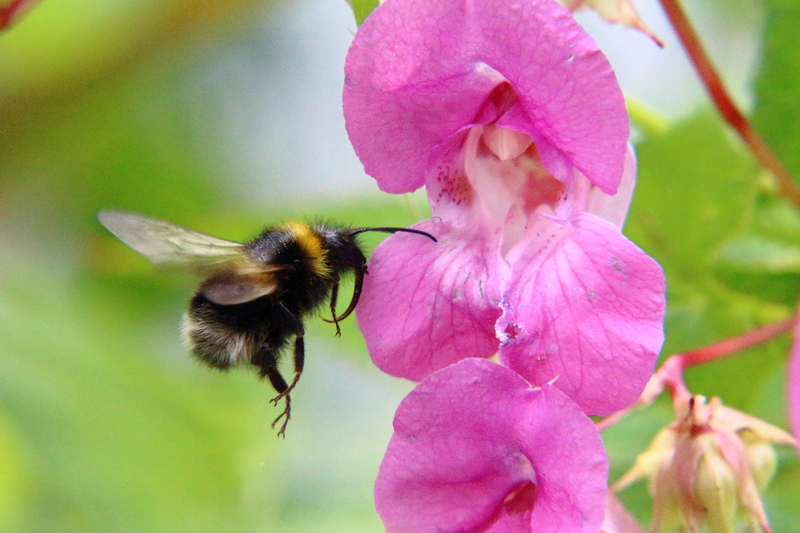 Therefore try to get the bee side on (or nearly side on) so that you make the best use of the plane of focus. 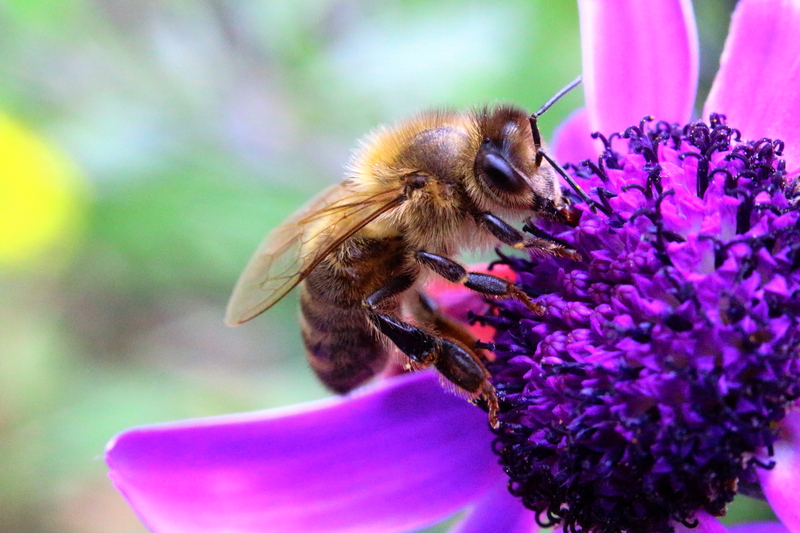 A honey bee shot from close-up with a Canon EOS 35-80mm lens, with the front element removed. This lens requires you to be very close to the subject though, so not practical for bees in flight. Rule 3: If shooting bees in flight, stand back! 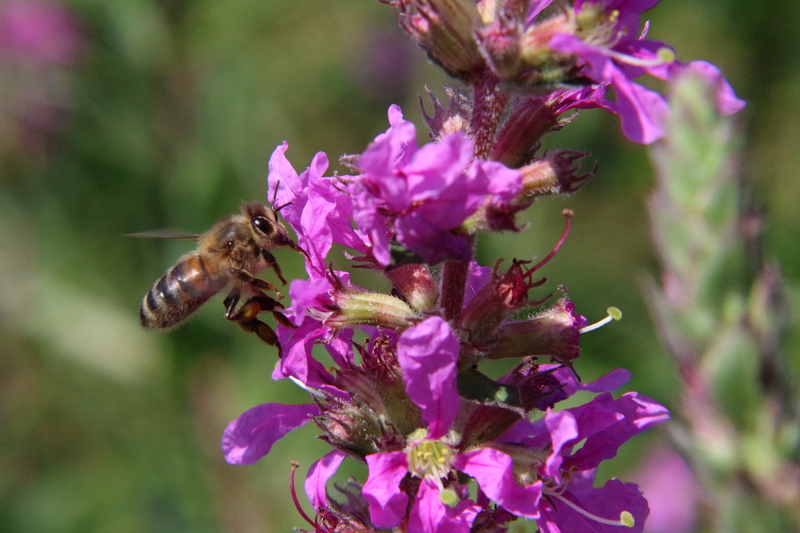 Coming in to land… A honey bee on (what I believe to be) Loosestrife flowers, in Kent. A really big problem when shooting flying bees is that they tend to fly too fast for most autofocuses (particularly on cheaper lenses) and too fast for you to rapidly re-focus the lens manually. You therefore need to get a bit clever about predicting the movement of bees. Try to remember that they tend to hover on approach and take off from a flower so they will be nearly stationary in flight for a fraction of a second – and that they “back out” from flowers having collected the nectar. This last point is critical, since it is easiest to “choose” a bee to photograph, while it is in a flower already. Like my advice above, about shooting stationary bees side on to make the best use of the plane of focus, the same is true for flying bees. If you can get the trumpet of a flower in perfect profile, when the bee flies out backwards, it should remain in the plane of focus. If you want to compose the shot so that it is not perfectly sideways on, then remember, still that the bee will come out backwards. What you need to do, then, is focus on the part of the flower closest to the camera lens, and as the bee backs out tilt backwards (roll back on your heels) trying to keep the bee in focus by moving the camera with it. It sounds simple, but can be really quite tricky! As with all things, practice doesn’t exactly make perfect, but statistically at least, the more times you try, the more likely you are to get it right!! A bumblebee backs out backwards… Pre-focus on the nearest section of the flower and roll back on your heels as the bee backs out to keep it in focus. At the time of writing (late September) there are still some bee species active, and conditions are good, as the days are now a little cooler. Try and get out this weekend and give it a go! Previous PostDo big numbers mean big cash? Shooting super-telephoto imagesNext PostGreat shots of cities at night? You need to learn to let go!